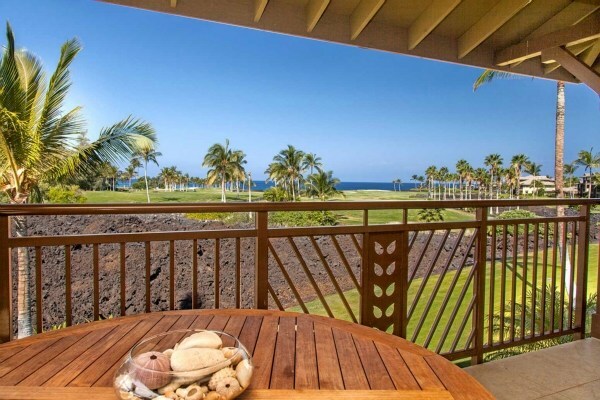 Finally, there is some selection in the Big Island’s oceanfront real estate market along the “Sunset Coast” from Puako to Keauhou. Changing times give us an oceanfront market that owners of legacy properties find a bit more enticing. Less regal properties are offered for sale as well. From vacant land like no others to condos along Ali’i Drive or Puako Beach Road fixers, the selection is pretty interesting right now. There are many more beautiful coastal properties than discussed here, these stand out from the rest! The most fantastic oceanfront property now on the market is a 21-acre, 4-taxkeys oasis of white sand beach, protected lagoon and rich history. Walk 10-minutes south along the beach from Anaehoomalu Bay at Waikoloa Beach Resort until you reach old beach shacks overlooking the lagoon. 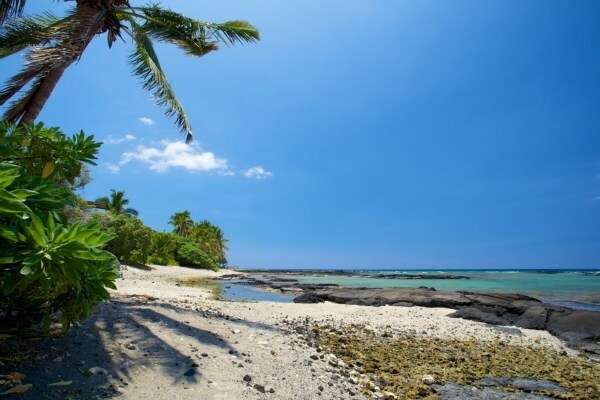 The property sits near the border where the South Kohala and North Kona districts meet. Ruins of an old Hawaiian village are buried under Keawe trees to the South. The clash between Hawaiians and the Fair American took place in nearby waters off this stretch of coast. (Different accounts place the encounter as far south as Ka’upulehu or as far north as Puako) A 3-masted schooner petroglyph is carved in the lava bank here, perhaps memorializing this event. If you ever wanted a place on a white sand beach to call home…click here to meet your new reality. “Truly a rare opportunity” cannot be stated more clearly in reference to this property. It is accessible by vehicle down a private road off of Queen Kaahumanu Highway. Oceanfront Puako just got better too with a price reduction of $400,000 at 100 Puako Beach Drive (MLS# 257993 click here), from $2,600,000 to $2,200,000, a much more reasonable price for this tear-down property. It is now priced in line with recent Puako vacant land sales. 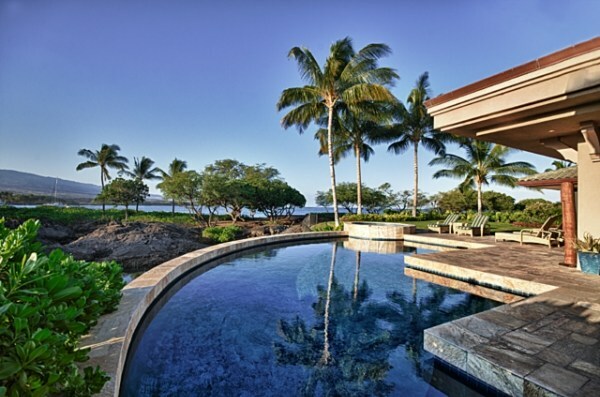 Best priced resort home, actually only true oceanfront resort home, is at Kolea Kai in the Waikoloa Beach Resort. First listing incarnation in 2009 at $8,750,000 was a bit ambitious, MLS# 257650 is now smartly priced at $5,995,000. Expect to see this sold soon given the dwindling inventory and improved value at this price. 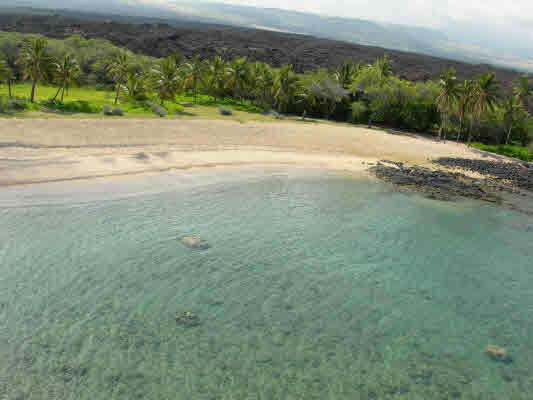 Another unique property is the 2.95 acre estate at the north point of Keauhou Bay where it is rumored John Wayne married his wife Pilar. Stately trees shade park like grounds here which include a functioning private dock at this richly historic setting of Keauhou Bay . 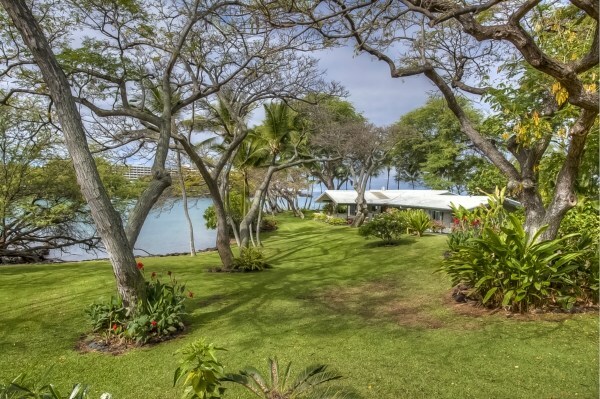 Years ago, when personal estates dotted the Keauhou Bay shores, private docks were common. More recently it claims its fame as a repository of a Vladimir Ossipoff designed home. This home was designed with the lighting, breezes and the ambience of this place in mind. The existing home may need updating but the benefit of the property consisting of two Taxkeys gives one the latitude to build a new home privately situated away from the exiting home. Pool, pool house and tennis courts complete the package. The Oceanfront condo list must be interpreted a bit more broadly than the other lists. Oceanfront condos translate to oceanfront condo “projects” . Some of the units listed may not really be oceanfront although they are in an oceanfront project.
. Hali’i Kai 8A, MLS #267028 is not a direct oceanfront unit in Waikoloa Beach Resort, but its views make it feel pretty close. 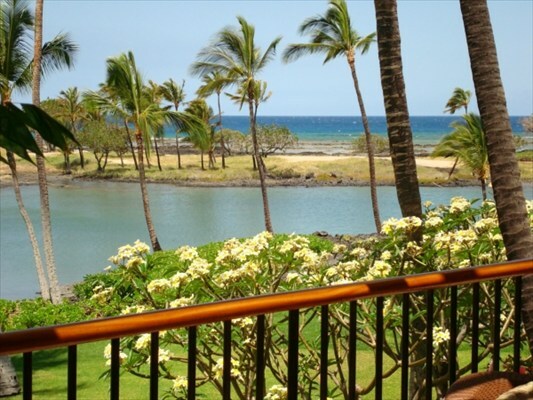 This Mauna Lani Terrace unit is one of the few 3-Bedroom condos you will find in Mauna Lani so close to the water. 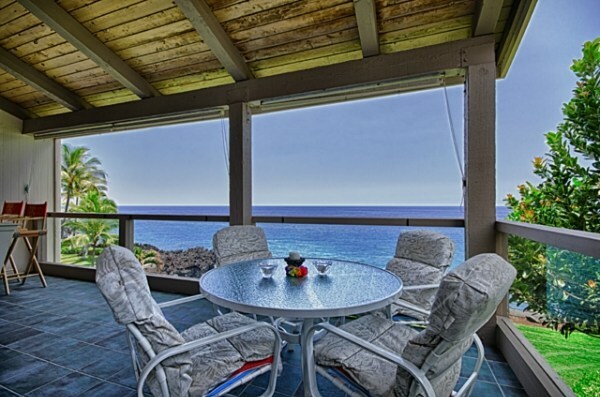 In Kona, a new listing of a Keauhou Kona Surf & Racquet Club #3301, MLS#267296 seems very reasonably priced at $699,000. Check out the lists below to see the oceanfront properties for sale along the Sunset Coast. Call or email when you have the time to talk real estate. Until then, take care, stay well, be happy and a hui hou! !